Abuja — The Federal Government is considering a review of the federation allocation sharing formula as demanded by Nigeria Governors Forum, NGF, to accommodate the N30,000 minimum wage for states. The NGF recently pushed for a new fiscal restructuring plan due to the present economic realities in their states, which they claimed had made it impossible for them to pay workers' salaries. The governors had also given two conditions upon which to pay the proposed N30,000: a review of the sharing formula that will see them get more money or downsizing of workforce, claiming that accepting to pay the new wage without fulfillment of the conditions will make the states go bankrupt. Though the Minimum Wage Tripartite Committee, led by the former Head of Service of the Federation, Ms Ama Pepple, had recommended N30,000, the Federal Government agreed to pay N24,000, while state governments insisted on N22,500. However, with the threat by the organised labour to shutdown the economy if the government refused to forward executive bill to the National Assembly on the N30,000 new minimum wage, the Federal Government summoned an emergency Federal Executive Council, FEC, meeting on Tuesday but it was resolved at FEC that the matter should be tabled before the National Economic Council, NEC, for further deliberations. A source privy to the National Economic Council, NEC, meeting said the Federal Government has decided to take the governors' request to the Council of State expected to meet on January 22. The source said: "We are making progress. We will be meeting with the Council of State on Tuesday, January 22. The governors are asking for a review of the revenue sharing formula and government is looking at that. The Minimum Wage Technical Advisory Committee inaugurated recently is looking into the revenue sharing formula." Asked to be specific on whether the Federal Government had agreed to allocate more resources to state governments, the source said "everything is in progress." Briefing State House correspondents after the NEC meeting, Governor of Kebbi State, Abubakar Bagudu, affirmed that the issue of minimum wage was discussed but added that he did not have the mandate of the council to brief on that. 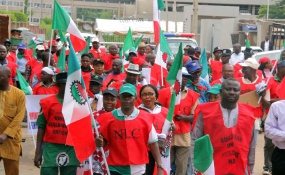 But Minister of Labour and Employment, Dr. Chris Ngige, who was the conciliator between organised labour and the Federal Government, said the Council of State would take a decision on the matter next week. Asked what the resolution of the controversial minimum wage was, Ngige said: "Well, there is no outcome as such, it's a work in progress, the Information minister told you the other day after the Federal Executive Council that we are taking our deliberations to the National Economic Council and then we close up on January 22 at the National Council of State. After that, we will be able to say where we are going. "Figure, frequency of review, those that have exemption and everything about the bill so that people will know because by then, we will be ready to transmit it to the National Assembly in consonance with our agreement with labour that we will transmit the new bill on or before January 23." Also reminded that governors have been insisting that they cannot pay N30,000, he said: "Well, it is not a question that the governors are saying that they cannot pay N30,000. Discussions are still ongoing and will terminate on January 22 when we meet with the National Council of State."